I'm wondering if anyone else has noticed the similarities between Dios and Momoka. I've been pretty diligent about separating Penguindrum and Utena in my analysis/viewing experience (judging it on its own merits and all that) but this one has always stuck with me. There are 24 episodes to this series. And, in the full opening song for Noruniru, one of the lines Etsuko sang was, "You will disclose secret of the world." So, was anyone else annoyed over what was the deal with Mario? He had a penguin hat of his own, but he only ever got a couple of lines, and a role as Masako's mcguffin. Considering that he was Himari's counterpart and the holder of the other half of Momoka's soul he really got sold short. And we never found out what the deal with his grandfather's spirit was, either. Also, how was Sanetoshi able to resurrect Masako? If he had that kind of power, you would think that he could already control the fate of the world as he wished. Masako even said that "Houdini's magic tricks" aren't enough to truly change the world, implying that the resurrection was a trick, but Masako still survived, and this plotline went nowhere. The series was an awesome ride, but it seriously needed two or three extra episodes to properly elaborate all the subplots it created only to leave them in the wayside. I'll never understand why we wasted so much time with Ringo and Tabuki in the beginning. I mean sure, it was funny and all, but I started getting bored of Ringo early on when it turned out each new episode was featuring her and the Takakura family (besides Shouma) wasn't getting much screentime at all. Ultimately, her storyline with Tabuki wasn't so important that it needed all those episodes. That's not to say it wasn't important, but the screentime in the first few episodes could have been distributed more evenly. It could have shown more of the Takakura family and the Natsume family (especially Mario) while still balancing the Ringo/Tabuki plot. It wasn't until episodes 9 and 10 until I really got into the series because of all the time wasted in the beginning. Yeah I see where you're coming from. I think it's because the whole time, the diary was believed to be the penguindrum, so the camera had been focusing on where the diary is, and whether Shouma will be one step closer to getting his hands on it in each episode. And then, when the diary was ripped in half, and was taken by Masako and Yuri, and with Sanetoshi's medicine, that was then when the diary, along with Ringo, no longer felt important, because it seemed like the penguindrum wasn't needed to keep Himari alive after all. I must confess myself confused by the ending. Why did both boys need to sacrifice themselves? I understand Shouma taking the fate transfer, but why did Kanba disintegrate? I thought the idea of the fate transfer was that it would bring Himari back to life. The idea is that Penguindrum is what will save Himari. Presumably, Kanba and Shouma both carried half of the penguindrum very early on (in the form on an apple). Penguindrum was basically like your ticket for survival. Both gave up their halves to make Himari whole. Shouma, I think, did a little extra by also taking on Ringo's burden of carrying the fires of curse with him. I think the question is, why does Ringo need to come in and dramatically transfer fate at all? What did the fate transfer add that Kanba and Shouma couldn't have done anyway? Shouma gave Kanba back his apple half, which allowed him to give the whole thing to Himari. But after he did that, he had no apple and so he disintegrated (like how the unchosen at the child broiler disintegrate.) But even though Kanba saved Himari, it wouldn't have saved all the people from the bombs on the train, so maybe Ringo did a fate transfer to get rid of them? I'm not sure why the fate transfer couldn't have saved both Himari and the train, but maybe it's sort of a "one wish" type ordeal - you can either save Himari's life or neutralize the bombs but not both. Can Ringo's fate transfer save both Himari and everyone on the train...? I think... even if the bombs were neutralized, fate transfer alone probably wouldn't have been able to give Himari a Penguindrum without taking it from someone else, so maybe Himari will still be considered as "unchosen" and die. I recalled that Momoka saved Yuri by "sacrificing" Yuri's father and sending him to a place where he'll never be found. It could be that Momoka took Yuri's father's "Penguindrum" and gave it to Yuri, while Momoka herself gets burned as the price she paid for changing fate. So... maybe this is what happened to Kanba and Shouma, they both disappeared, such that Himari lives on. Except in this case, they chose to die for her. Maybe it's Kanba and Shouma's part of the job to be the one that give the penguindrum to Himari, while the fate transfer facilitates the process and completes the rest of the job of stopping Sanetoshi's plan to destroy the world, something Momoka intended to do in the first place. If I had any real insight into the symbol sets of this show (or brains), I would make a new thread for it all. As it stands, all I can do is point a few things out as I see 'em. 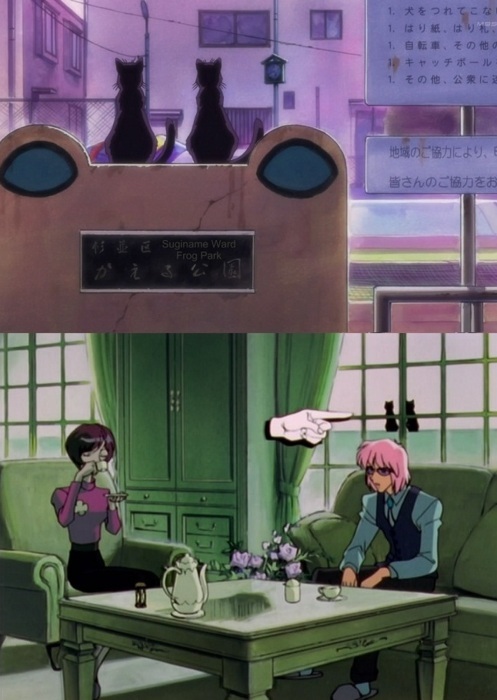 Like this possible call-back to Utena. So like, has anyone ever considered the significance of the zoo being a significant point in the series? I mean, forget penguins, what about zoos? That seems symbolic... beautiful exotic creatures being caged up in fake habitats being observed by humans? Yes? So let's do some APPLE MATH. Assumptions are: 1) if you share the fruit of fate with someone, you will share your life with them, 2) any time you redistribute apples, a new fate is made (a la alternate universe), 3) Himari and Kanba don't have apples at the start of the fate the series features because 4) People going to the Child Broiler have lost their apples. 5) Himari, Shouma and Kanba are the sheep in the Fire allegory with Mary. So the whole point of this is to save Himari, yeah? The reason she is cursed is because she bears the brunt of the punishment the Takakuras must bear as a result of the actions of their parents. The way of undoing this curse and saving Himari then, is to make it so that she is no longer a Takakura. Instead, Ringo shares half of her apple with Himari, and the quarter of Shouma's apple that Himari has is given back to him. This fate transfer however, makes it so that Himari no longer is connected with Shouma or Kanba, but she is connected with Ringo. This is why Ringo and Himari are friends in the epilogue, but neither know Shoma or Kanba, who remain brothers. 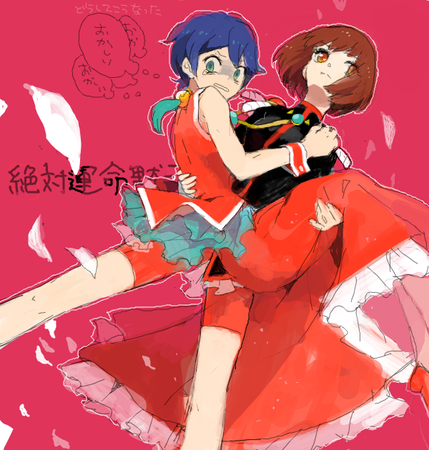 I often can't help but compare Penguindrum with Utena. Both brilliant works in their own right, with the difference being that Utena is something that one can start watching from a later episode and still able to (partially) understand the show, while anyone trying to skip episodes in Penguindrum will be at a complete loss of what's going on. As to which show is "better" . . . I honestly could not say. The way of undoing this curse and saving Himari then, is to make it so that she is no longer a Takakura. Instead, Ringo shares half of her apple with Himari, and the quarter of Shouma's apple that Himari has is given back to him. Hm, the way I saw it was that Shouma and Himari both combined their apples back into a half and then Himari gave Kanba back the half (since it was his originally.) Kanba turned around and gave her the whole thing back to save her life, but since he no longer had any of the apple, he took on the child broiler fate and shattered. Does anybody know what is the name of that incredible music score they played towards the ending of Ep 24? I remember it starting out as a delicate piano piece in the scene with Masako Natsume wakes up and tells her little brother about her dream of Kanba saying he loved her, then gradually enriched itself into a full orchestra at the point when child Kanba and Shouma walked into the starry sky followed by the 4 penguins. I need this info to complete part 3 of Seinen Kakumei Utena. P.S. found the song name already! I've just watched the first episode. Looks lovely. Ok, I've watched the entire series. Didn't like it. Pushed a good character too far down the wrong track? No problem at all, just grant him a noble death, instead of dealing with him after his sister's death and all the murders committed in attempts to save her. It's weird how angry I feel having watched this. One more thing. Wasn't SKU partially about the darker side of self sacrifice? What happened to Dios after Anthy 'saved' him? Oh, not to worry about that either because the saved girls don't remember a thing! All better. For the curious, a recent episode of ANNcast pretty much consisted of Zac and Bamboo trying to unspool their thoughts having just finished Penguindrum. Of course immediately deciding that they're going to have to rewatch it several times, but it was still fun to listen to them go on and on as they tried to unpack such a dense anime for about 45 minutes. Just finished this anime - I wouldnt say I was disappointed but I'm really not sure if I liked it. I started it simply because I enjoyed Utena so much. Naturally, I found myself comparing Penguindrum to Utena throughout and it was very nice to see recurring themes expanded upon - I would say Penguindrum helped me to understand Utena's ending better. Where did this anime go wrong? Well I really couldn't get invested in the characters at all. I'd say they were all lacking in personal development and consistancy - none of them were particularly memorable or interesting to me like the Utena cast and their relationships. The story itself was convoluted but on the whole manageable to follow, though parts were as confusing as the Black Rose arc times 10, particularly nearer to the ending. It was clunky, put bluntly, and so was the symbolism - while Utena had finesse and grace, Penguindrum felt like her little sister trying on mum's lipstick. While the ending was a bit sloppier than Utena's, my praise goes to the show for actually having a solid ending and tying a fair deal up. Am I disheartened by this? No, I will definitely be paying attention to the creator's future works. I probably wouldn't recommend penguindrum though, it felt a bit of a chore to watch.